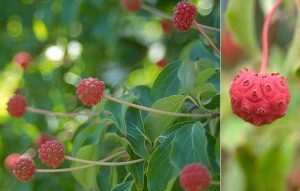 Kousa Dogwood (also called the Japanese Strawberry Tree) is a flowering dogwood originally native to Japan, China, and Korea. First introduced to Europe and the United States in 1875, the Kousa dogwood is now widely planted because of its distinctive and decorative creamy-white bracts (sometimes tinged with pink) that appear after native Dogwoods. 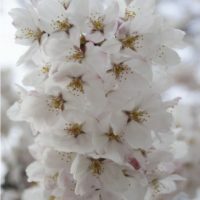 A wonderful addition for any home landscape, it has no serious disease or insect problems in the United States and its blooms attract bees and butterflies. The Kousa Dogwood also has fruit that attracts birds and squirrels. Believe it or not, the fruit is edible to people. 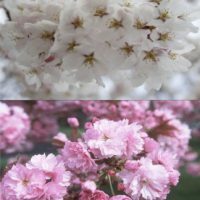 The bark of this beautiful tree is rich brown-red and flakes to reveal fresh cream or fawn bark beneath, adding to its beauty. 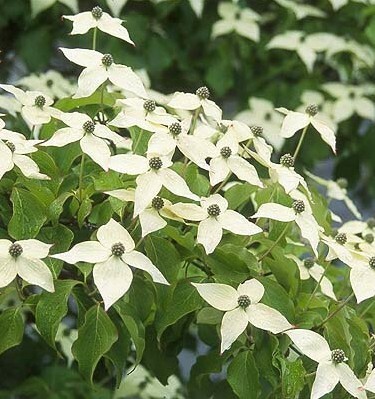 It is mildly sun tolerant and offers beautiful red and purple fall colors. More planting instruction can also be found at boydnursery.net/planting/. Leaves: Leaves are opposite, simple, elliptic-ovate, 2 to 4 inches long, 3/4 to 2 inches wide, acuminate, cuneate, and dark green in the summer. Leaves turn reddish purple or scarlet in fall, persisting for 3 to 5 weeks, significant variation in intensity of fall color. Rate: Slow, possibly medium in early stages of growth. Flowers: The true flowers are small and inconspicuous and are produced in a 5/8 inch diameter rounded umbel on the upright 2 inch long peduncle that originates from short lateral spurs at the end of a small 2 to 4-leaved twig; the creamy white bracts are the showy part of the inflorescence and are borne in June, approximately 2 to 3 weeks after those of Cornus florida; the 4 bracts are taper-pointed, 1 to 2 inches long, 1/4 to 3/4 inches wide; the flowers, being stalked, are raised above the foliage creating a milky way effect along the horizontal branches; the bracts persist for up to 6 weeks and longer; in the aging process they often become pinkish. Tremendous interest in a pure pink or rose bracted form but most start white and age to pink. 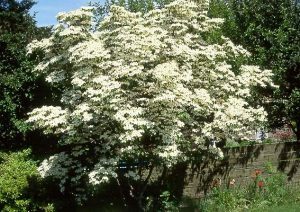 Landscape Value: Handsome small specimen tree or shrub, excellent near large buildings or blank wall, tends to break up harshness with horizontal structure, works well in shrub border or in a foundation planting at the corner of the house; the horizontal lines break up the vertical lines and make the home appear larger; difficult to overuse this plant; the flowers appear in May to June when there is often a paucity of color; perhaps the finest specimens in the United States are located at Longwood Gardens. Soil Preference: Transplant balled and burlapped as young specimen, considered more difficult to grow than Cornus florida, but this is doubtful. Enjoys acidic, well-drained soil and seems to perform best in sandy soil with good organic matter content.